Thematic vocabulary sets are the best way to learn vocabulary. The research shows that students learn these sets much more quickly than semantic sets. Moreover, they remember the words much longer and they confuse them less. Even our poll has showed that 100% of teachers consider these sets very useful. These thematic sets are difficult to find. If you search the internet, you will find only a few thematic sets and none of these are suitable for teaching. That was why we started to prepare materials with thematic sets which could be taken and used for teaching. You can find our first thematic set for birthday here. And this time we offer you the BED set. In this post you will find an infographic with example sentences and an exercise to practise the vocabulary. All the words in the BED set were chosen in the following way. There can be only two words which are the same part of speech to minimize the possibility that students will confuse the words. Therefore, there are only two nouns, two verbs and two adjectives. These words are then organised into a mind map and their meaning is clearly illustrated. 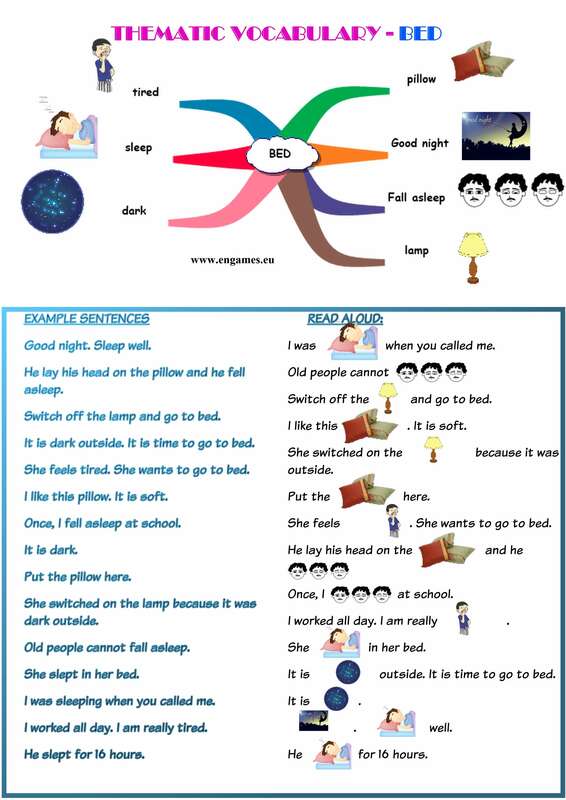 Under the mind map you can find example sentences. It might be a good idea to read the sentences with your students aloud to practise the pronunciation. Next to the example sentences, there are the same sentences but this time the key words are replaced with a picture. Your students should read the sentences aloud and you check their answers in the first column or the mind map. If you want to print the infographic above, download the following pdf file and print it.